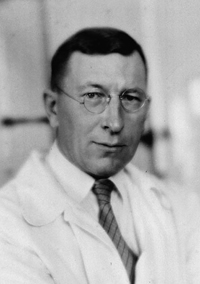 Nobel Prize winner Frederick Banting developed the idea of insulin into a practical treatment on humans, marking one of the biggest medical discoveries of the 20th century. Alongside Charles Best, Banting chose to make insulin available to diabetes patients without charge, which led to insulin therapy and production spreading across the world. Banting was educated at the University of Toronto, where he first studied divinity, but transferred to medicine shortly after. After being injured serving in the First World War – he was awarded the Military Cross from heroism under fire – he became fascinated with diabetes. Building on existing research that reported a hormone named insulin controlled the metabolism of sugar, Banting investigated why a lack of it led to increased sugar in the blood and urine. Previous attempts to insert patients with pancreatic extracts or a fresh pancreas failed. Banting’s research at the University of Toronto led him, though, to create a pancreatic extract, which after weeks of experimentation, resulted in thousands of islet cells being left behind. Extracts of insulin were then taken from these islets. First, the insulin was tested on dogs, which regulated their blood glucose levels. Later in 1922, it was tested on Leonard Thompson, the first human being to be administered with insulin. The first dose failed, as it was too impure, but a second dose purified by James B. Collip, proved successful. Banting further developed the insulin alongside laboratory director John MacLeod, and the two of them were awarded the Nobel Prize in Physiology of Medicine in 1923. They shared the prize money with their entire team, who were not recognised by the Nobel committee. Banting later investigated problems from silicosis and cancer, before serving in the British and North American services during the Second World War. In 1941, he was killed in an air crash during a mission. In 1989, the Queen Mother lit a flame of hope in Banting’s honour, commemorating all the people who died from diabetes. The flame will only be extinguished when a cure for diabetes is found.